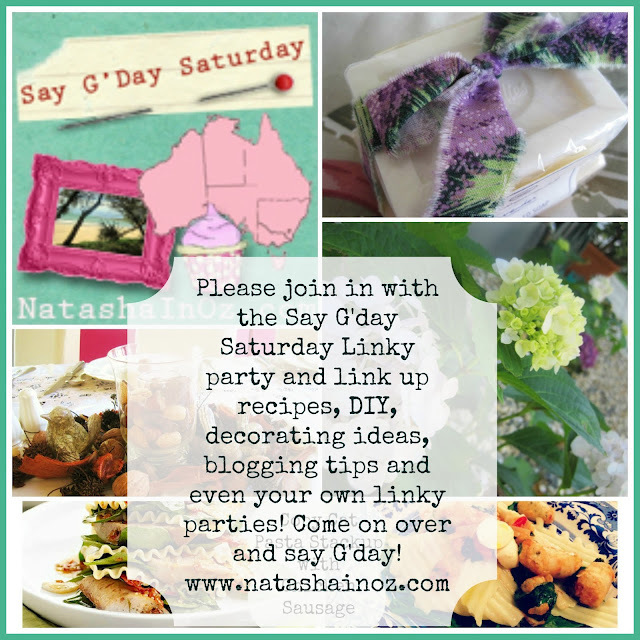 Say G'day Saturday Linky Party ~ My Favourite Finds! 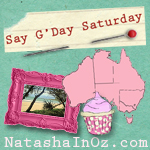 Hello friends and welcome to this week's Say G'day Saturday Linky Party! Thank you so much for stopping by today. I hope your week has been as fun and fulfilling as mine! I have had a wonderful time teaching again and even though I am spending lots of time preparing for lessons and re-learning the important skills of time management I am loving every minute of my busy-ness! The week has ended on a very happy note as we have all helped Big Al celebrate his 12th birthday on the second of the second 2012! I have also had a few moments to myself to do a little bit of pinning! I have pinned a variety of things this week and I have found lots of fun ideas, lovely things to wear, inspirational words, yummy treats and pictures that are just too beautiful not to pin! I hope you find this week's pins as Pinteresting as I did! Yes, I am already thinking about Easter! I am also thinking about the Weekend! Cheers! I have also been listening to lots of music this week, especially my new favourite singer, Mindy Gledhill who I posted about here. I hope you don't mind if I post another of her songs that I just love! I hope you enjoy Anchor. Thanks so much for joining in and linking up! Don't forget to come back later and say G'Day to some of the lovely bloggers who have linked up! Thanks so much for visiting today. Please say G'day if you have a minute and be sure to join in with this week's Say G'day Linky party if you haven't already. Hi Natasha. Great photo of Big Al, and I love his birthday cake!! What wonderful images you have picked out for us today. Absolutely stunning! I love the colour of that nail varnish, and the ones of all the pretty vintage plates. Have a happy weekend my friend. Great post Natasha; we are also celebrating our son's birthday this month; my baby will be 40. I agree Pinterest is the best. I get lost in the world of pinterest. Love your choices to show off. Thank you for hosting this fun party! I always enjoy it. Come by if you wish. Natasha, happy birthday wishes to that handsome boy. I see he has some chocolate. ;-) I'm serving up plenty of chocolate at HFTS today. Stop by and have a bite. I want to join Pinterest, but they haven't replied to me. I missed the party last week - so glad you're back! You found so many pretty things this week! I'll be re-pinning away! What a lovely post filled with beautiful inspiration. Happy Birthday to your son. Pinterest my favorite pastime. What a great idea for a blog party. Happy birthday to that sweet and handsome boy! Happy pinning, all you shared is terrific, I love the wreath. Thank you for hosting Natasha. Happy weekend. Hi Natasha~ Birthdays are always wonderful to celebrate and such a handsome young man! Love your pinterest pics - especially the one about what if there were no more pinterest! I don't know what I'd do either! Great post Natasha; we are also celebrating my son's birthday this month; February 18 He is a big Baby of 45 years old. Thanks so much for hosting your party for as all. Thanks again for hosting! Love being here! Great pictures, Natasha. I esp. love the one of your son's birthday. I wish my son would still let me take his picture like that...teenagers, ugh! Delightful! Have a beautiful pink Saturday, enjoy! Some great stuff this week Natasha - love the clothing and the nailpolish colour!! Hi Natasha. Happy Pink! This is wonderful! Happy Birthday to Big Al. Miss coming here. ( I haven't been around for sometime). I see you're using LINKY tool too! I'm trying to get the word out about it. I hope you don't mind but only for this week my post doesn't contain a pin or song. I just want to get people to add the linky tool to their blogs so we all use it! If you'd prefer to remove my link up, I'll understand. What a handsome young man. And you've pinned some great images this week! Love this pink post, my favorite are those pink dishes! Hi Natasha, Birthday greetings to Big Al on his happy day. Love the pins today, the nail polish is gorgeous. HPS! What a fantastic post and a Happy Birthday greeting being sent out as well!!! Happy Pink Saturday and happy everything, dear Natasha. I love that smile your birthday boy is sharing. Tell him I send birthday wishes from North Carolina, USA. I'm so glad you shared another of Mindy's song. She is fantastic! Birthday blessings!!! Just think, one more year before teens. :) I can smile, I'm on the other side of it. With that gorgeous smile of his, I'm sure he will be a fine teenager. Following on Linky now, hope you'll follow to. Oh, and I LOVE that gingham and goodies heart. NATASHA! I love your pins! The clothing pins are right up my alley! Thank you for popping by place and commenting! Happy Birthday to you handsome son. He looks really exited and happy with his treats. Hope, he had a great time. Your pins are always beautiful. Oh, I love the clothes! Something I am trying to pay more attention to on Pinterest. And, then knowing my dreamy nature I put up a costume design board this week and it is all of these flowing gowns from period piece movies! !LOL I can't even fantasize about clothes without it being in a castle or an English manor! The tea pins look yummy! Have a great week Natasha and Happy Birthday to AL! They grow up too fast!! Thanks so much for linking up!! Have you seen my Lisa Leonard giveaway yet? I loved looking at all your pins!! Thanks for linking this up to the Take it on Tuesday blog hop. Just calling by from frozen Lazio, still unbelievably cold here. Happy Birthday to your son, the years just rush by don't they. Lovely photos as usual. Happy birthday to your son. Thanks for linking up to Serenity Saturday Link Party! Hi Natasha! I so love your blog and the emphasis on Pinterest...totally addicting and yet so much fun. I would need to live at least 9 lives in order to do a portion of my pins....I wanted to thank you for linking up at my party so many times....love the variety that you showcase...and esp the food!! Take care! What an incredibly beautiful song and video, Natasha! Your Pinterest features are utterly inspiring and lovely as always! Definitely tantalized by some of the treats, tickled by the life-without-pinterest printable, and coveting the spring bulb centerpiece.